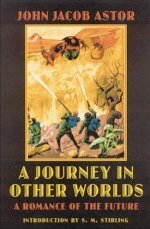 A Journey in Other Worlds: A Romance of the Future is a science fiction novel by John Jacob Astor IV, published in 1894. The book offers a fictional account of life in the year 2000. It contains abundant speculation about technological invention, including descriptions of a world-wide telephone network, solar power, air travel, space travel to the planets Saturn and Jupiter, and terraforming engineering projects — damming the Arctic Ocean, and adjusting the Earth’s axial tilt (by the Terrestrial Axis Straightening Company). In Astor’s novel, the future United States is a multi-continental superpower. European nations have been taken over by socialist governments, which have sold most of their African colonies to the U.S.; and Canada, Mexico, and the countries of South America have requested annexation. Race conflict is a thing of the past, since the “dark elements” of the American hegemony have died out. Space travel is achieved by linking an airship to a comet. Jupiter proves to be a jungle world, with flesh-eating plants, vampire bats, giant snakes and mastodons, and flying lizards. The Americans discovera wealth of exploitable resources: iron, silver, gold, lead, copper,coal, and oil. Saturn, in contrast, is an ancient world of silent spirits. The spirit beings provide the explorers with foresight of their own deaths.